The passage I shared with you last week actually describes two lives that are like trees, just very different kinds. One life is blessed, but the other is cursed. The cursed life imitates a bush in the desert – relying on entirely wrong things to keep it alive. While the desert bush may fight and scrap and somehow stay alive, it’s unlikely to ever thrive. Likewise, when we trust only in our own strength, or the strength of our family, friends, posse or gang, we’re going to struggle instead of thriving. And our lives will ultimately become desolate. The second life Jeremiah mentions is the blessed life, the one compared to a tree living by the water. 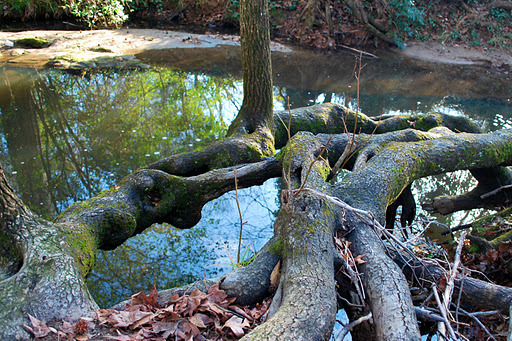 In the photo, you can see how large the roots have grown as they reach out over and down into the creek. It may be hard in this winter season to imagine drought and heat, but these trees have sent down their roots so that even in the heat of summer, they can continue getting the water they need to thrive. Just as roots save a tree and keep it alive, we can cultivate faithful, obedient practices in our walk with God that will prepare us for times of distress and keep us from setting up camp in the desert places we sometimes find ourselves. Notice that Jeremiah doesn’t say the tree planted by the stream will not fear if the heat comes. He says the tree “will not fear when the heat comes” (v. 8, emphasis mine). When. No one wants that word, “when.” When a man comes home and tells his family he has lost his job. When the doctor speaks the word “cancer.” When a car accident changes lives. When a spouse of several decades walks out. When a young son dies. When, when, when. Droughts come into our lives in varied ways – even to those of us who are Christians. Our faith does not provide a genie in a bottle, ready to grant our every wish and give us perfect lives. No, instead of waiting for a genie to show up, we Christians have a greater gift, a greater promise to cling to: God is with us and sustains us when the heat comes, and our faith means that we will continue to grow and bear fruit, even after the droughts have done their worst. He has planted us where we will grow best and will always provide for our needs. Let that truth of God’s protection seep into your heart and mind: You have been planted by the water. Be confident that your roots are strong and that He will sustain you and help you bear fruit. What are some of the ways you feel sustained? For me, it’s writing and sharing a weekly message with you, but it’s also spending time with family and friends, going for a challenging run, listening to music, or going to a museum. I’d love to hear your stories of how your life is imitating the green tree and what God has put into your life to sustain you. Or maybe you’d like to share about a time that your life was more like that desert bush and God rescued from that desolate, desperate place. Either way, I’d love to hear your stories. So please share them in the comments below. Now, I hope you’ll forgive me a sudden topic shift and a brief moment on the soap box. But I’d like to tell you about an issue that’s important to me as a writer of a blog and as someone who relies on the internet for research, social networking and so much more. You may have noticed that Google has a black swath across its logo today on its home page. If you click on the black swath, you’ll go to this story about proposed legislation that would limit freedom of expression on the Internet. We hear all the time about oppressive regimes that shut down Google and other sites, but I’ve always thought I lived in a country that was not one of those regimes. However, there’s a vote next Tuesday – January 24 – that could considerably weaken our country’s ability to get information from sites many of us frequent (Wikipedia, Google, WordPress, Facebook, Twitter, …). Who’s behind this bill? Big media and the entertainment industry. Here’s a video that gives a better summary than I’ve given. I was really frustrated this weekend that NBC was able to have a stranglehold on Olympic trials marathon coverage – reducing those of us who didn’t travel to Houston for the event to getting text updates from sites other than NBC. NBC didn’t broadcast the event live (I guess Babar cartoons are sacrosanct for them). And they refused to allow video coverage on other sites. It wasn’t the most fun way to follow an exceptionally exciting set of races, but for most of us who cared, it was the only way. This small example points to a greater problem with the monopoly big media would like to have on content. And it simply doesn’t sit well with me. If it doesn’t sit well with you either, please consider signing the petition against SOPA/PIPA legislation. Thanks. I’ll just go put my box away now. This entry was posted in flourishing tree and tagged blessings, Jeremiah, roots, trees by hopesquires. Bookmark the permalink. Hope,Thanks for the great reminder. Yes, the "whens" do come. The picture of the tangled, stretching roots reminds me to make my faith practice a priority, so I'll be sunk deep in Him.